ROLLING seven-day strikes at seven Central Queensland coal mines could start late next week, mine union leader Steve Smyth has warned. 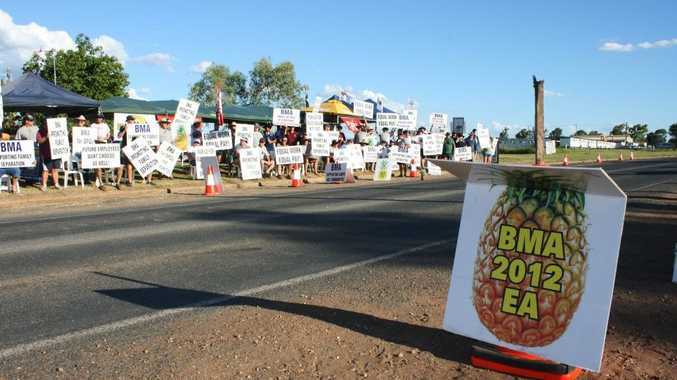 The long-running stand off between mine owners BMA and the Construction, Forestry, Mining and Electrician Union will continue after a second ballot to accept BMA's offer to employees was voted down on Friday. While more employees voted to accept the BMA offer on Friday, the ballot failed to achieve majority support, with 82% of employees voting down the offer. Mr Smyth said the union already had members' approval to start around-the-clock, seven-day strikes at every BMA coal mine in the Bowen Basin. "We'll be looking at considering the strikes from late next week, and we have a mandate to do that from our members so it's just a matter of notifying the company," he said. "The employees have now twice voted down BMA's offer, and even with the pay increase, what the employees want is improved conditions. "The ball is in BMA's court now, we're more than happy to go back to the negotiating table again." It was understood the cost of the strikes to the company would be significant. But a spokeswoman for the company said such costs had not been quantified, and there were no plans as yet to instigate a force majeure. BMA president Steve Dumble said while support for the company's offer had increased from 7.8% to 17%, the company was disappointed by the result. "Our wages offer is a very strong one particularly in the context of current economic uncertainty," Mr Dumble said. "Guaranteed 5% increases across each of three years for wage levels that are already twice the national average will be difficult to continue to maintain given prices for our products have fallen by 30% in the period between the two ballots. "BMA recognises that we have more work to do with employees to explain the nature of our business circumstances and the benefits of the agreement we are offering. "We will return to the bargaining table as quickly as possible to further explore how we might find acceptable solutions to the key issues which have prevented us from reaching agreement up to this point."